Living neurons on an array of electrodes were shown to have rudimentary memories; researchers Itay Baruchi and Eshel Ben-Jacob of Tel-Aviv University published their study in the journal Physical Review E. This combination of living tissue and hardware could lead to cyborg-like memory chips; it could also help neurologists understand how our brains work. 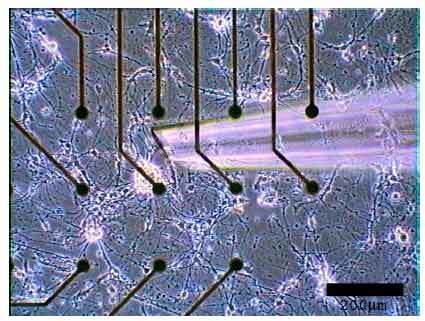 Baruchi and Ben-Jacob introduced a chemical stimulant into the neuron culture at a selected location; this induced a new firing pattern in the neuron culture. Twenty-four hours later, they repeated the process, creating another firing pattern. These patterns persisted for more than forty hours. According to Baruchi and Ben-Jacob, this proves that it is possible to store information in a cultured neuron network. It's not clear to me how this work goes beyond earlier experiments in the field. In 2004, Naweed Syed at the University of Calgary ran a series of experiments that showed that snail nerve cells on a silicon chip could be shown to have retained memories (see Nerve Cells Grown On Microchip). More recently, University of Florida scientist Dr. Thomas DeMarse has created a "brain in a dish" that can interact with a computer flight simulation. Find out more in this article - Rat Neurons In A Dish Now Playing Flight Simulator. Science fiction writer Peter Watts correctly anticipated these studies in his 1999 novel Starfish.